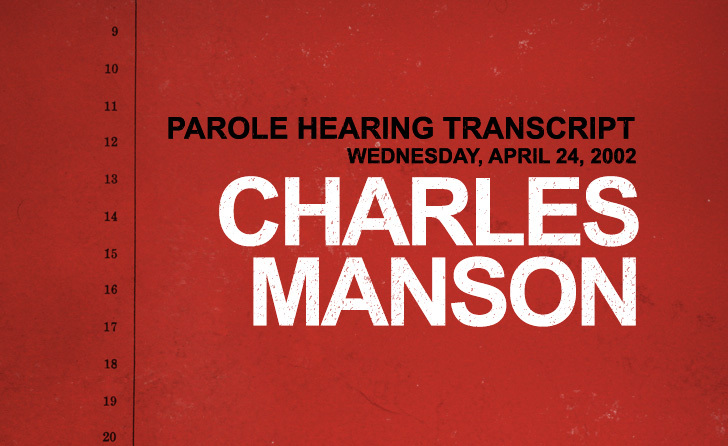 Sept. 17 – On Wednesday, April 24, 2002, a California parole board found Charles Manson unsuitable for parole for the 10th time, at a hearing held at Corcoran State Prison in Corcoran, California. Manson, reportedly refused to attend the hearing because he would’ve been required to appear handcuffed. A review of Manon’s prison record showed he had 17 serious infractions in the five years since his last hearing. Some of the infractions listed were, failure to participate, disrespect, noncompliance with grooming standards, possession of a weapon, and setting a mattress on fire. The short hearing was the attended by Sharon Tate’s younger sister, Debra Tate, who became the first member of her family to appear at one of Charlie’s parole reviews. Manson was denied the maximum 5 years.